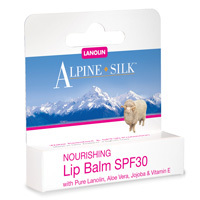 New Zealand Lanolin New Zealand Gifts. 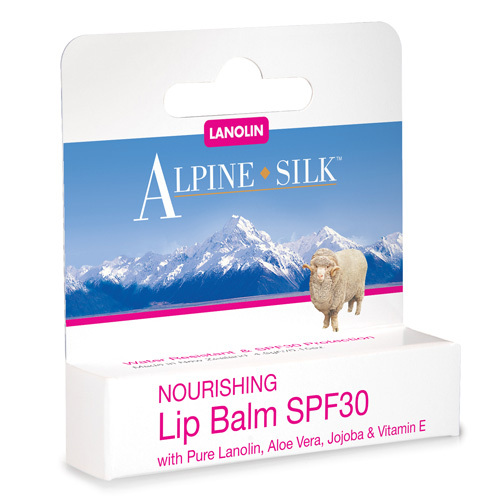 The secret of Alpine Silk skincare was discovered in 1890 in one of the worlds most natural and unique environments - an isolated sheep station in Caterbury, New Zealand. All day the shearers hands were immersed in the sheeps wool. This wool was heavy with nourishing lanolin Oil. As a result the owners wife realised the natural skincare qualities of lanolin and began to make her own Lanolin based soaps and skincare. Her secret was passed down through the generations and today they continue this tradition and the secret recipe with Alpine Silk skincare. Modern science has now proven that Lanolin Oil is the closest oil produced by nature to our own skins oil. 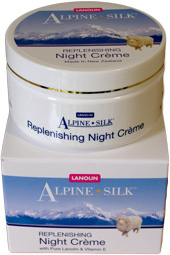 Pamper yourself with Alpine Silk skincare and enjoy beautiful, younger looking skin. 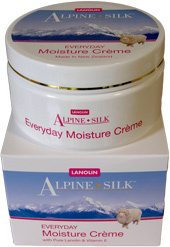 The Everyday Moisture Creme has been passed down through generations. The Vitamin E will assist in protecting your skin cells from free radicals while the pure Lanolin will help moisturise and gently hydrate. Use regularly and your skin is left feeling refreshed and silky smooth. Revitalise and protect your skin. The natural hydration of pure lanolin is boosted with collagen to help enhance skin firmness and elasticity. the addition of vitamin E with it's anti-oxidant properties may also assist in boosting natural collagen production leaving your skin feeling soft and supple. After an intense day, Replenishing Night Creme has been designed to nourish and renew your skin while you sleep. The advanced formulation of pure lanolin and vitamin E gently absorbs into your skin to help re-energise and increase your natural moisture levels. Your skin will be left feeling smooth and re-invigorated. 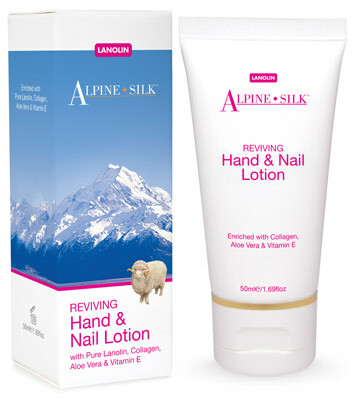 Alpine Silk Rejuvenating Hand & Nail Lotion is designed to intensely moisturise and help repair your hands. Collagen assists to reinvigorate cells while Lanolin and Aloe Vera hydrates. Vitamin E helps provide natural protection against the free radicals your hands and nails come into contact with, while Keratin aids in preventing dry cuticles and promote strong healthy nails.